Does your wall switch for your fireplace not work? Does it only work some of the time? 1st Choice Chimney’s gas fireplace specialists will look at your wall switch and troubleshoot to figure out why it’s not working to give you warm, glowing flames. We will also replace your bad wall switch with one that works better, if that is what the situation calls for. If you need to replace or repair your toggle switch for your gas fireplace, 1st Choice Chimney has you covered. We repair and replace any kind of gas fireplace switch so that you and your family can enjoy the luxury of your gas fireplace sooner. What is a thermopile? It is a device, important to your gas fireplace’s function, that converts thermal energy into electric energy. The purpose of a thermopile in a gas fireplace is to detect thermal radiation, for gas burner safety control. It is also are used to provide spacial temperature averaging, and to provide an output in response to temperature as part of a heat flux sensor. If your thermopile is broken, our experts at 1st Choice Chimney will test and repair your faulty thermopile sensor. If your gas fireplace has corroded valves, our experts will repair or replace your fireplace’s valves. A common problem gas appliance owners experience. Often the problem can be fixed be re-lighting the pilot light. However if you find yourself constantly lighting the pilot light, there could be several other problems going on. If this is you, call our experts at 1st Choice Chimney today. We will repair or replace your pilot light, so that you are able to enjoy your fireplace. If you think your gas fireplace has defective sensors, we will test them to determine their level of function, and replace or repair them depending on their condition. Loose connectors in your gas fireplace can lead to serious problems with your fireplace, like a house fire. To prevent this, it’s important to have a specialist take a look at the condition of your fireplace and make sure that there are no problems like loose connectors. If you have loose connectors, our fireplace experts will tighten them or replace them if needed. A thermocouple is an important part to your fireplace. It is a device that keeps the pilot gas tube open while the pilot light is lit. Over time thermocouples wear out and need to be replaced. In order to determine that your thermocouple needs to be replaced, it’s important to have an expert test your pilot light. At 1st Choice Chimney, we both test the pilot as well as replace or repair the thermocouple. It takes specialized skills to install and repair gas fireplaces. That’s because a fuel leak or faulty equipment could result in putting the lives of your family in danger. That’s why all of our 1st Choice Chimney employees receive special training before performing any repairs or installations, making them highly qualified to repair your existing gas fireplace or replace it with a new one when it becomes obsolete. We can also assist you with the process of selecting your new gas fireplace. We want you to have the most attractive, safe, and easy-to-use gas fireplace that’s perfect for your home or business. Contact us to learn more. Gas fireplaces are the future of fireplaces. There are numerous advantages to having a gas fireplace over a traditional wood-burning fireplace. Gas fireplaces require minimal cleanup. They don’t leave the rest of the house cold. They save you money on heating. You don’t need a chimney to have a gas fireplace. There’s no labor involved: no splitting and hauling logs. Can turn it on and off with the flip of a switch. You can install wall-thermostat control, and control your fireplace’s heat with your thermostat. With gas fireplaces, you don’t need a chimney. In an unvented gas fireplace system, your fire is contained safely behind the glass and the gas is burned cleanly and efficiently. This way, no gas, fuel, or toxins are released into your home. A gas fireplace will burn either natural gas or propane. However, natural gas is less expensive, and on average produces more heat for your home. It is recommended to choose natural gas, and when natural gas isn’t available, to choose propane. The gas that you choose is also dependent on whatever gas is used and lined in the home (traditionally this is natural gas). Where Can I Put A Gas Fireplace? 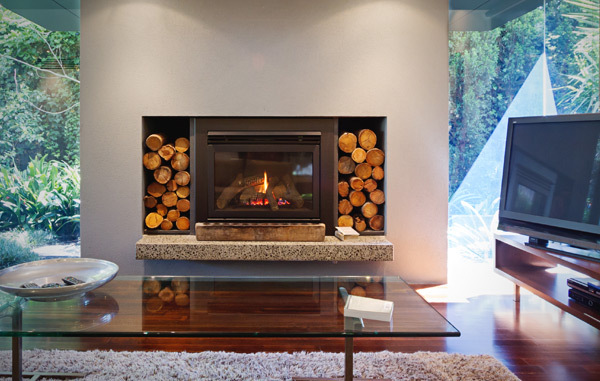 When you invest in a gas fireplace, you can put it anywhere in your home. Yes, anywhere. It can be installed along any internal or external wall. Wood-burning fireplaces, however have architectural and building requirements because of the fact that they require a chimney. What Is The Difference Between Vented And Unvented Gas Fireplaces? The two different kinds of gas fireplaces are vented and unvented fireplaces. Vented gas fireplaces are like traditional in that they require a vent to filter air in and out. This is common for owners of a home with a traditional wood burning fireplace that is converted into a gas fireplace. An unvented gas fireplace, surprise, doesn’t have any vent system. With unvented, all of the gas fuel is burned, so nothing is released into your home and there is no need for a vent system. Unvented fireplaces involve a glass door that is used to seal the gas fire log in, as an extra precaution to prevent gas and toxins from being released into your home. Is There Danger With Gas Fireplaces? All kinds of gas fireplaces are completely safe for you, your loved ones, and pets. In a properly functioning gas fireplace, no fumes, toxins, or gas will be released. All fuel is burned completely and cleanly. Many people think that because it involves gas burning, that there is the potential for danger. However, gas fireplaces are safer than traditional wood burning fireplaces. Wood burning fireplaces produce large amounts of carbon byproduct that can leak into your home if your chimney isn’t cleaned regularly. Gas fireplaces burn all of the fuel that they are fed. This means that nothing dangerous is ever released into the home. Also, most gas fireplaces come standard with a safety light that detects when any gas may be leaking. If it detects anything it immediately clamps down on the gas fireplace and stops all gas from being led to the fire. This prevents any gas leaks from entering your home. The answer to that question depends on the type, size, and number of features your gas fireplaces has. In general, gas fireplaces are much more affordable than wood burning fireplaces. In the long-run, gas fireplaces are a smart investment. They help you cut down on your heating bill because they help heat your home without the use of your heating system. Do Gas Fireplaces Have Environmental Benefits? Wood burning fireplaces are very inefficient when it comes to their fuel-to-heat ratio. They typically require a large amount of wood to produce a moderate amount of heat. Their by-product is harmful to the environment, and can harm your home if they aren’t cleaned. Gas fireplaces, however are clean in that they burn all of the fuel used. Not to mention they only need a small amount of fuel to produce a large amount of heat. Gas fireplaces promote the principle of “zone heating”, when you only heat the areas of your home that are most inhabited. This prevents waste of heat, and helps the environment. Gas fireplaces are a safe and efficient way to add heat and a soothing ambiance to your home. They are clean, safe, and efficient. If you are interested in a gas fireplace for your home, call 1st Choice Chimney today. 1st Choice Chimney specializes not only in chimney cleaning, but fireplace repair and installation as well. Once a problem is diagnosed by our technician, each client will be given the cost for parts and labor upfront. Please note that some older & unique gas fireplace parts can require special orders. These parts usually take 7-14 days to deliver. 1st Choice Chimney warranties labor for 30 days. 1st Choice Chimney is not responsible for manufacturer part defects. Manufacturer will warranty part. 1st Choice Chimney does not repair Propane Fireplaces – Due to Insurance Liability. 1st Choice Chimney will chart for any additional trips outside the original scope of work to fireplace. All Spark & European Gas Fireplace require a Trip & Diagnostic fee at $229 + Parts & Labor. 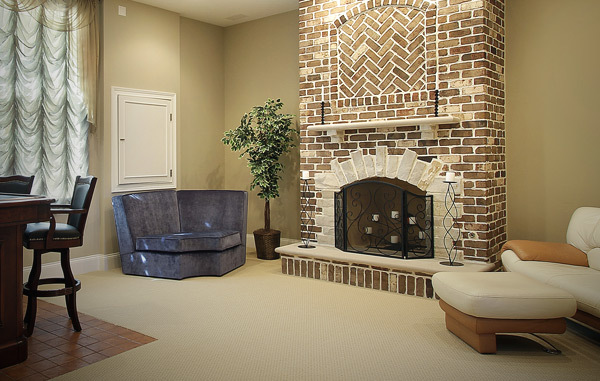 At 1st Choice Chimney, we know how much a beautiful fireplace adds to the comfort and value of your home. Not to mention a gas fireplace is the most convenient way to enjoy having a warm welcoming fireplace. No wood to carry in, no time-consuming fire-lighting, no clean-up, just clean-burning gas flames. With 1st Choice Chimney, you have the option of choosing from a wide range of beautiful gas fireplaces for your home. A quaint gas fireplace could be just the thing for adding both beauty and ambiance with dancing flames that invigorate the senses, and bring a feeling of comfort and peace to your home. A gas fireplace not only enhances your home’s overall appearance, but also boosts its resale value. In addition, lots of families find that their fireplace becomes their central gathering and entertaining spot. With 1st Choice, we give you the ability to customize all aspects of your gas fireplace. We have a beautiful selection of stone veneer products to surround your fireplace and match your decor, fireplace doors and hearth accessories to add more style and customization to your fireplace, styles of gas logs to look exactly as you like, and inserts to surround your fire and complete your fireplace. We specialize in gas fireplace installation in the Dallas, Fort-Worth, and Austin, Texas areas. 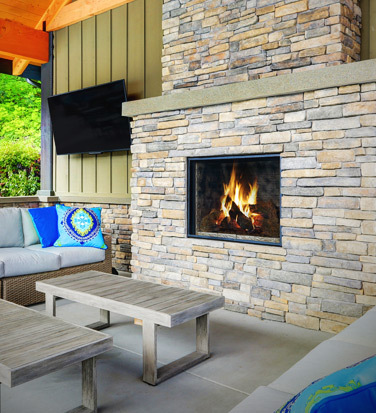 We also provide outdoor fireplace installation! Complete your outdoor decor by bringing the warmth outside. We have everything to ensure your fireplace is exactly how you want it. Not sure if your location is in our service area? Just give us a call to find out and schedule your gas fireplace installation or repair. It’s one of the best things you can do for your home and your family. Gas fireplaces give you the convenience and ease of a simple flick of a switch or touch of a button. In addition, they really closely resemble the looks of wood-burning fireplaces beautifully with gas logs that are extremely realistic-looking. Looking for Gas Fireplace Logs? 1st Choice Chimney recommends the RH Peterson G52 Burner and Log Set. Our goal at 1st Choice Chimney is simply to provide the very best customer service in our area of expertise and to exceed all of your expectations whether providing installation or repairs. We are constantly striving for the day when we can become a household name in all of the many areas that we service. Our promise to you is that you will always receive friendly, honest, and affordable service from our team of experienced people who will make sure that your expectations are met and then some. We want you to become a lifelong customer and call us whenever you need help with your gas fireplace, or a new one. Give us a call today for a free consultation!